If you're looking for a fun and easy mosaic project to decorate a piece of furniture, a tray, or a spot in your home, consider making a wave design. This simple project is great for beginners, and it can help introduce you to the art of mosaics. It's also a lot of fun! 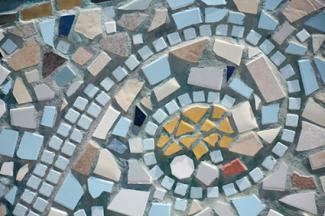 You can adjust the size and scale of your mosaic to suit your project needs. If you're doing part of your bathroom floor or wall you'll want to make a larger design. You can also change the colors to fit the space where you'll be displaying the wave. How Do Guppies Give Birth? The amount of time the project will take you depends on the size of mosaic you choose, but expect to spend at least three hours on this project, plus drying time. In addition, you'll need something to use as a base and an adhesive. If your mosaic will be exposed to water, use cement backer board from your home improvement store. If not, you can adhere the glass to any strong surface including wood furniture, trays, or pieces of wood. Paint the surface white before you begin. The type of adhesive will depend on the surface. For cement backer board use white thinset mortar, which you can buy at your home improvement store. For wood or other surfaces, you can use a glass-friendly adhesive product like E6000 or Weldbond. 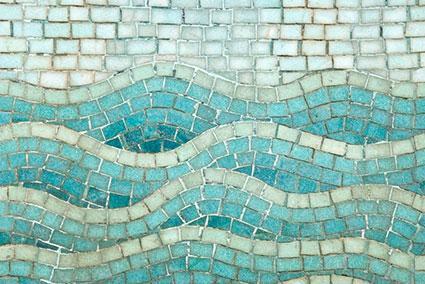 Start by deciding on the exact size and shape you have in mind for your wave mosaic. Cut the posterboard to these dimensions. Cut a piece of mosaic mesh to these dimensions as well. Use a pencil to draw the wave design on the posterboard. In the case of the abstract wave mosaic shown above, start with a gently curving wave line approximately 1/6 of the way up from the bottom edge of the posterboard. Draw another curvy line with a slightly different wave pattern another 1/6 up the sheet of posterboard. Repeat this process with two more random wave lines. Use a ruler to make a straight line all the way across the posterboard just after the top wave. Trace over the pencil lines with a thick black marker. Place the posterboard on a cookie sheet. If it's too large to fit, cut it accordingly and use multiple sheets. Place the mosaic mesh on top of the posterboard pattern. If the mesh wants to roll up, use rocks or other heavy objects to weigh down the corners. Put on the leather gloves and goggles. Be sure to work in an area where you don't have to worry about pets and children coming in contact with broken glass. Take one of the white glass strips and use the nippers to cut off random lengths. Cut several pieces at an angle, since you'll need angled pieces to make the curves of the wave. When you've done one strip, begin laying the pieces out just below the first wave line. Leave about 1/8 inch between each piece of glass. Cut more white pieces as needed so you can do all the white lines in your design. When you need to, use the nippers to cut a piece to fit in a specific spot. Using the lighter shade of blue glass, work your way down from the white line. Use the same process of cutting angled pieces and turning them to fit. Cut specific shapes as you need them. Do one or two lines of light blue and then move on to dark blue until you've reached the next wave. Use more white glass strips to work your way up to the straight line above the top wave. From there, use white rectangles of random lengths to fill in the rest of your mosaic. Very carefully transfer the cookie sheet or sheets to the oven and bake according to the instructions on the mesh package. This will adhere the glass to the mesh and make it easy for you to transfer it to your project. Allow the mesh to cool. Prepare the surface for your project by making sure it is free of dust. If you'll be using cement backer board, make sure you have securely mounted it on the wall, floor, or to the furniture. Apply the adhesive to the surface. If you're using glue, work in small sections to keep it from drying too quickly. If you're using thinset mortar, you can do about a square foot at a time. For thinset, use a notched trowel to get an even coat. Carefully lift the mesh and lower it down onto the adhesive. Try to set it straight down in the correct position to avoid a bumpy surface. Gently smooth it down with the grout float to make sure it adheres properly. Continue adding adhesive as needed to cover the surface of your project. When you're done, allow it to dry for the time specified on the adhesive. For thinset mortar, wait at least 24 hours. Consider how you'll be using the item. If you will be touching it, use a Dremel tool and diamond bit to grind away any sharp areas on the edges of the glass. If you'd like to grout your mosaic, mix up some white, non-sanded grout. Spread it evenly over the surface of the glass with the grout float and wipe off any excess with a damp cloth. Carefully polish each piece of glass with a dry cloth to make sure you don't end up with a grout haze. Allow the grout to cure and then use a sealant to keep it clean. Make a cresting wave by drawing a pointed wave line on the posterboard. Fill it in with the varying shades of blue in the way described above. Instead of glass strips, use random glass pieces from your craft store. You can find them in the mosaic section. Simply arrange them on your posterboard to create a totally different wave look. Experiment with other colors. Waves can be lots of shades of blue, green, white, and gray. Try out different color combinations to find one that works well in the space you plan to display your work. If you have some broken blue dishes, use those to make an upcycled wave mosaic. You can also buy inexpensive dishes at thrift stores and break them to get the pieces you need. Remember to grind the edges if you'll be touching this project. Get creative with texture too. You can add glass marbles and use different thicknesses of glass to create a dimensional design. Decorate something three-dimensional like a garden planter. The mesh allows you to bend your design to fit a curved surface. Just make sure you grind down any sharp edges, since those will stick out a bit more on a curved item. Mosaics are a fun way to create beautiful art for your home or garden, and a classic ocean wave design can work just about anywhere. Although the process is time consuming, the results are worth it. You'll love looking at your custom wave mosaic for years to come.